The combination of the Hyacinth x Scarlet Macaw makes for a very uniquely colored parrot! Being a cross between a Hyacinth Macaw and a Scarlet Macaw gives this interesting macaw a lot of varying influences, both in color and in personality. As you can see in the picture above, this hybrid has the very strong indigo blues of the Hyacinth Macaw, as well as the very strong reds of the Scarlet. Those prominent colors, along with its white eye rings and white skin tones makes it look very patriotic, like a 4th of July bird! The Hyacinth x Scarlet Macaw is a first generation macaw, meaning its parents are two species of naturally occurring macaws. The Scarlet Macaw, one of the most highly favored macaws, is described as "beautiful and striking". The Scarlet has been the best known South American parrot for over 100 years. The other parent, the Hyacinth Macaw is a majestic looking, and expensive bird that most macaw enthusiast would love to own. It is also the largest of the macaws, and is known as a highly social and extremely gentle pet bird. Hyacinth macaws in the wild are endangered, but they have done well in captivity and are becoming more firmly established today. Though hybrid macaws are bred for color, they are a mixture of more than one type of macaw, so the offspring are influenced by the traits and characteristics of both of parents. The father has the dominant gene and that will generally influence the offspring's coloration and overall appearance. In the case of the Hyacinth x Scarlet Macaw above, it is a toss-up to tell which parent was the father as the powerful colors of both parents are present. The temperament and behavior of hybrids are areas of uncertainty and are unpredictable. The Hyacinth x Scarlet mix may be even more unpredictable than others hybrids, as its parents have two basic different personalities. Both parents make wonderful pets if well socialized, but the Scarlet tends to have a dominant personality while the Hyacinth tends to be gentle and amiable. A hybrid such as this will require good socialization and a firm consistent hand in training on an ongoing basis. Scientific Name: The Hyacinth x Scarlet Macaw is a first generation hybrid, a cross between: Scarlet Macaw Ara macao and Hyacinth Macaw Anodorhynchus hyacinthinus. Description: Hyacinth x Scarlet Macaw has a very unique color combination with strong reds, indigo blues and greens. Both parents of the Hyacinth x Scarlet Macaw contribute to the colors of their offspring, though the father's have the dominant gene and this will influence their final appearance. In this combination, the Hyacinth Macaw contributes to the the rich indigo blues while the Scarlet contributes the reds, greens and gold's along with some blue. Size - Weight: A large full sized macaw, they can get over 2 lbs. Because of the size of the large Hyacinth Macaw, lengths could be up to 106 cm (42 inches). In the wild, their parent species eat a variety of palm nuts, fruits, and seeds. A Hyacinth Macaw will eat mainly raw nuts. Provide your Hyacinth x Scarlet Macaw with nuts and a good parrot mix which includes; formulated diets, seeds, dried fruits and nuts. Nuts you can provide them include Brazil nuts, walnuts, macadamias, filberts, almonds, and hazel nuts. They will also like fresh coconut. They may also be offered fruits and vegetables. For good strong development, babies will need a high fat content in the hand-feeding formula. Social Behaviors: It is generally believed that hybrid macaws get the best attributes of the parents. In this case these attributes are quite variable. A Scarlet Macaw parent makes an intelligent if somewhat boisterous and demanding pet bird. The Hyacinth Macaw on the other hand is sweet, affectionate and extremely gentle. Scarlet's can be quite loud while Hyacinth's are not inclined to make a great deal of noise and have a very even temperament. The Hyacinth x Scarlet Macaw can be a very sweet, gentle bird, but may insist on things being in its own way. They are a typical macaw and can be cranky at times. To have a well rounded bird that enjoys more than one person, make sure it is well socialized with lots of folks, and has an ongoing firm hand in training. 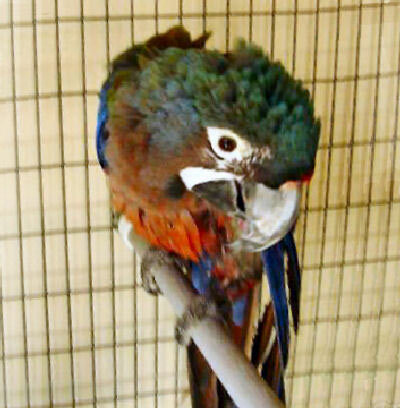 Finding these macaws for sale is generally hard as they are very rare, and they are expensive. There are more and more macaw breeders however, so finding these macaws for sale may become easier if they become more common.